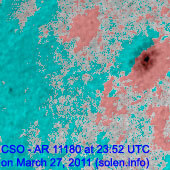 Last major update issued on March 29, 2011 at 04:20 UTC. 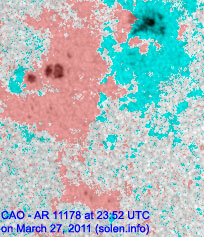 The geomagnetic field was quiet on March 28. Solar wind speed ranged between 321-370 km/s. 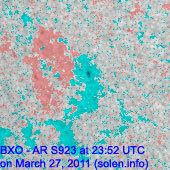 Solar flux estimated at 20h UTC on 2.8 GHz was 119 (increasing 8.5 over the last solar rotation). The planetary A index was 3 (STAR Ap - based on the mean of three hour interval ap indices: 2.6). 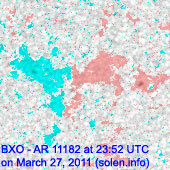 Three hour interval K indices: 10001111 (planetary), 10001111 (Boulder). 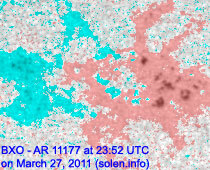 At midnight UTC the visible solar disk had 7 spotted regions. 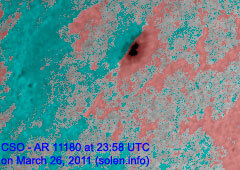 Region 11176 decayed further and only has penumbra on leading polarity spots. The spots in the region extend longitudinally over 27 degrees, however, there is only penumbra at one end of the region. None of the penumbrae are large. Magnetically there's only minor polarity intermixing and as such the region is not very complex. Additionally opposite polarity spots occur at quite a distance from each other. Classifying this region is difficult. An FSI classification is possible as the penumbrae are spread out over more than 15 degrees, however, CSI is more accurate from a polarity perspective and when considering the lack of trailing polarity penumbrae. 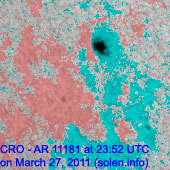 Flare: C1.4 at 11:39 UTC. Region 11177 was quiet and stable. Region 11178 decayed slowly and was quiet. Region 11180 was quiet and stable. Region 11181 was quiet and stable. Region 11183 was quiet. The region has minor polarity intermixing. An M class flare is possible. [S920] reemerged on March 27. Location at midnight: S27E18. 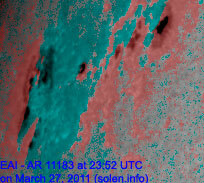 March 26-28: No obviously Earth directed CMEs were observed in LASCO and STEREO imagery. The geomagnetic field is expected to be quiet on March 29-31.